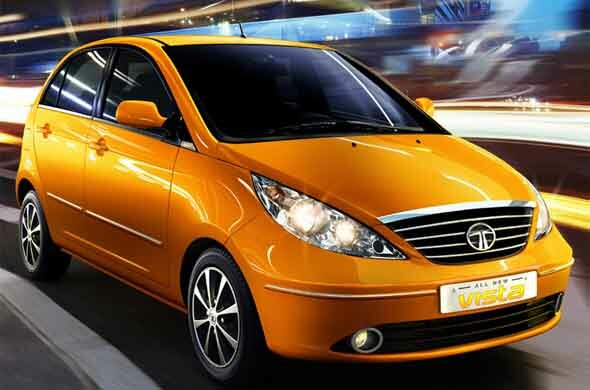 On August 23rd, Tata Motors launched the refreshed Vista in twelve variants with prices starting at as low as Rs. 3.88 lakh. The company hiked prices of the Vista in January 2012 and hence, the Vista is now priced in the range of Rs. 3.97 lakh – 6.26 lakh. In all, there are six petrol and six diesel variants of the new Vista. Here we take a closer look at what each variant offers us and what are the prices across cities. At present, buyers have many options to choose from apart from the Vista: Maruti Suzuki Swift (Rs. 4.36 – 6.65 lakh), Fiat Punto (Rs. 4.81 – 7.07 lakh), Volkswagen Polo (Rs. 4.57 – 7.16 lakh),Nissan Micra (Rs. 4.10 – 6.17 lakh) and Skoda Fabia (Rs. 4.46 – 6.96 lakh). However, Tata Vista has contemporary features at a slightly lower price that help is swerve past the Swift. Further, Tata’s wide sales and service network can also assure confidence among potential buyers. The variants have been named as the LX, VX and ZX (diesel variants) & GLS, GLX, GVX and GZX (petrol variants) replacing the earlier nomenclature such as terra, aqua and aura. The Vista is available in two petrol engines – the Safire 65 and Safire 90. The Safire 65 is a 1.2 litre, 65 bhp motor that makes 96 Nm of torque is offered on the GLS, GLX and GVX variants only. The Safire 90 is a 1.4-litre petrol engine that makes 89 bhp of power and 116 Nm of torque. This engine is offered in the GLX, GVX and GZX variants. According to ARAI, the petrol Vista Safire 65’s mileage is 16.7 kmpl while that of Safire 90 is 13.7 kmpl. The Vista is available in two diesel engines – the TDI and Quadrajet. The 1.4-litre TDI, turbo-diesel engine makes 70 bhp of power and 135 Nm of torque. It’s offered on the LS and LX variants only, as this is Bharat Stage III (BS III) compliant engine. The 1.3-litre, Quadrajet engine (BS IV compliant) sourced from Fiat is, makes 74 bhp of power and 190 Nm of torque. This diesel variant is offered on all four diesel trims, the LS, LX, VX and ZX. According to ARAI, the Vista TDI returns a mileage of 19.4 kmpl while the Quadrajet returns a mileage of 22.3 kmpl. See our video review of the Vista Quadrajet here. The new Vista gets good bits from its sibling the Manza, such as three-barrel headlamps and Sahara-beige interiors. The rear of Vista gets a pearl-black finish strip. Overall, the Vista is a spacious hatchback for five adults and a decent boot size of 232 litres. The LS/GLS variant of the new Vista doesn’t come with music system, Bluetooth connectivity, central locking and keyless entry. The LX/GLX variant gets all the features that the base model and in addition, has features like 2-DIN music system with speakers, Bluetooth connectivity and front power windows. The VX/GVX variant of the new Vista gets four power windows (front & rear), electric HVAC controls, tilt adjustable steering, intelligent rear wiper, rear windscreen demister, ABS with EBD etc. The following are the features in the Vista VX/GX. The ZX/GZX variant have all the bells and whistles including alloy wheels, dual front airbags, front ELR seat belts with pre-tensioners and load limiters and LED high mount stop lamp.